Brief Synopsis – The story of a reluctant music teacher and how his life evolves over the years. My Take on it – I fell in love with this movie from the first time I accidentally stumbled into the theater to see it. 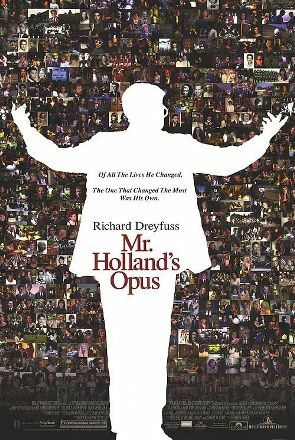 This movie is built up so well giving us a strong enough depiction of Mr. Holland’s life as a teacher helping us understand his life, his loves and his frustrations along the way. I cannot recall another movie that gives us so much about a character’s life over the span of 30 years that isn’t based on a true story besides perhaps Forrest Gump (1994). Each of the segments of his life give us enough to understand his character and what it would be like to live his life and the culmination of this story is written spectacularly..
Richard Dreyfuss is amazing in this movie and I think that this is perhaps his best role ever. He was nominated for an Oscar for Best Actor for this movie. He lost to Nicolas Cage for Leaving Las Vegas (1995). The way they made him look younger in the first half of the movie and gradually reached his current age was done so well. Movies usually prefer to use a younger actor and age him instead of de-aging an older actor. They made the right choice here to do it this way. The supporting players are also great here; William H. Macy, Olympia Dukakis, Gleanne Headley, Alicia Witt, Terrance Howard, Jean Louisa Kelly, Jay Thomas, Balthezar Getty and Joanna Gleason round out that supporting cast. The music here by Michael Kamen is excellent and also the choice of songs used were done expertly. I even own both Soundtrack CD’s that were released and loved hearing the songs once again. This is a movie that lots of people probably missed out on and it’s a huge pity since this was done so well. This is one of my favorite movies and tells a beautiful story that many people can relate to since almost all of us have had a teacher or two (or more) who found a way to inspire us! Bottom Line – Very powerful and emotional film about adding up all the small parts in life to get a clear picture of everything that you may have done. Dreyfuss is amazing here!. Highly recommended! Sounds awesome. Great post. I am such a fan of William H. Macy. Will do a quiz on him soon. Thanks for the great idea. That ending gets me choked-up just about every time. Nice review. As a teacher, most flicks about teachers drive me crazy. Because what flicks about teachers show usually isn’t good teaching. But this one. This one. I totally agree with you. It is heartfelt, moving and deeply memorable. Is it one of my favorite movies ever? I don’t know. Not impossible it’d be in the Top 100.